I do not know what has happened to my tomato plants, but they have fizzled out. Some one told me that they may have gotten too much water with all the rain we received earlier in July. The plants have died, or are dying. 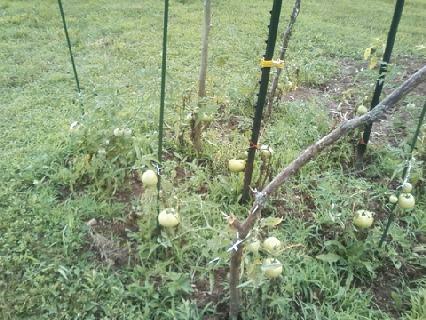 There is one lone living plant out of ten planted; with one lone, small green tomato coming along. The first tomatoes I picked were large and firm, and they were really good eating. Great on sandwiches, and just to eat along with chicken, mashed potatoes and such. Well, we did get to enjoy a few. Thank the Lord of all Creation for that wonderful blessing. Thank you Lord Jesus. In an April 16, 2015 post I wrote of planting 10 tomato plants. This picture is showing how those plants are doing. Those are some of biggest, tomatoes I have seen in a while. They are the best I have ever planted or had anything to do with. I am enjoying having a garden this year. I have planted some carrots, squash, cucumbers, sweet corn, and bell peppers. Some of them are beginning to break through the soil. The rain we are being so blessed with will be a great help in having a wonderful garden. I hope yours is doing well too. Growing garden along the banks of Flat Creek. When I got up this morning it was 32 degrees. There was frost on the ground and I was sure glad I had that trampoline over our tomato plants. There seemed to be frost only in low lying places. When I left the house to go drive my bus route the temp had dropped to 31 degrees. It warmed up to 79 degrees this afternoon. Love the Springtime. The ten tomato plants are doing great too. For where my wife and I live we planted tomato plants earlier than we probably should have. We however had the opportunity to purchase some plants that were big and healthy for a very good price; and I purchased ten of them; so they needed in the ground. On Thursday April 09 I purchased 10 Hybrid-Big Ds from a former Cassville School Teacher, and Bus driver who had purchased several from someone he knew. I was told these plants are selling in Walmart and other places for 6 – 8 dollars per plant. He charged considerably less. On Saturday April 11 in the early evening hours we (Madge and I) put them in our garden. I have been concerned with frost dangers for the earliness of the time; but I thought of a very good cover for them. We have a trampoline in our backyard, that goes unused for weeks on end. I got to thinking; “You know the grass grows beautifully under that thing. Why not pull it down over the plants.” I did that this morning. Now no frost worry. Now if there is a hard freeze or something, that will be a different story. Looking forward to having some good tomatoes this Summer. We are getting a very good rain today. Since it began this morning it has been coming down slow, easy, and soaking the ground. I do not believe there is any run off. I know that does not help the Flat Creek or the branches which run into the Creek and eventually Table Rock Lake. It is very good for the ground. There has been no thunder, lightening, or wind; no storm of any kind. At least that I have noticed. To the Good LORD above for the rain let us be thankful.